Directions: Part freshly washed, damp hair into large sections - apply conditioner with fingers. Cover hair with a plastic cap & allow the conditioner to soak for up to 30 minutes. Sit under a hooded dryer for an even more intense treatment. Rinse thoroughly with warm water. Ingredients: Aqua, Aloe Barbadensis Leaf Juice, Behentrimonium Methosulfate (and) Cetearyl Alcohol, Butyrospermum Parkii (Shea Butter) Fruit, Orbignya oleifera (Babassu) Seed Oil, Ricinus communis (Castor) Seed Oil, Prunus armeniaca (Apricot) Kernel Oil, Ulmus rubra, Althaea officinalis (Marshmallow) Root Powder, Cinnamomum cassia, sodiumlactate, Glycerin, Phenoxyethanol (and) Caprylyl Glycol, fragrance. My Thoughts: First, I should mention that this review is not sponsored. Yes, I won this conditioner but I was not coerced, advised, instructed, or enticed to do a review of any form on it. 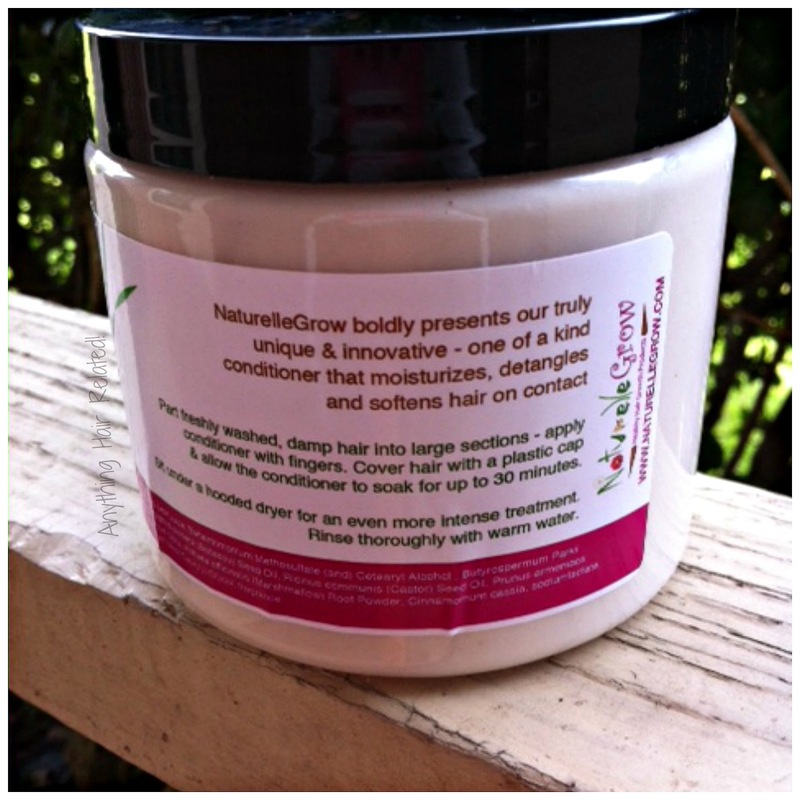 These thoughts are 100% my own and I love this conditioner. Lol...Moving on to the good stuff....this conditioner is HANDS DOWN THE BEST CONDITIONER I HAVE EVER USED. Like ever...(Taylor Swift voice). I wanted to give this conditioner a few trial runs before my review because when I first used it I thought I loved it too much. Lol I was thinking okay, give it a week, let the "love at first deep condition" simmer down, and try it again. This second time around, I clarified my hair with shampoo to remove any type of product build up.And there it was again, love, love, love! 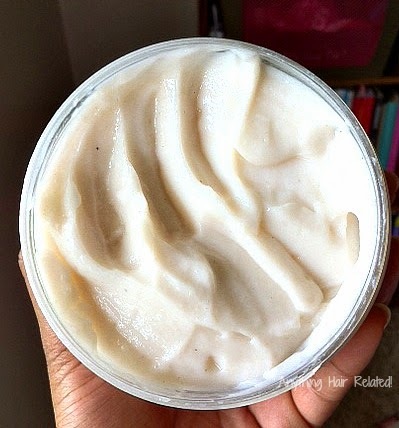 The first time I used it, I only used a tiny scoop and it was enough to evenly distribute throughout my hair. As you can see from the photo, this is all the product I've used after 2 washes (jar was filled to the top when I received it). Each time I used it, I only took out maybe two quarter sized amounts. That was all I needed for my shoulder length, natural hair. This marshmallow root conditioner is THICK. It kind of reminds me of actual marshmallow creme in the jar, that you can buy from the grocery store to make rice crispy treats with. Also, it have a creamy fluffy appearance and is silky to the touch. The smell of this product is pleasant and not overbearing at all. I think I smell cinnamon in it and some fruity notes too. There are also visible brown flecks in this conditioner...it may be cinnamon, marshmallow root, or elm bark but they are tiny. This conditioner gets rid of tangles like nothing I've ever used before. As soon as my conditioner coated fingers met my hair, all I noticed was instant softness and each one of my curls were separated and defined. The conditioner soaked right into my hair. No dripping, white coated strands, or anything. It was just touchable soft. After rinsing, I felt not residue but my hair felt so light and fluffy. I could run my fingers through my hair and that shocked me. My "It's A 10" miracle hair mask is great at de-tangling my hair but it doesn't quite sink into my hair the way this conditioner does. Even after my hair was completely dry after styling, I still felt the softness. 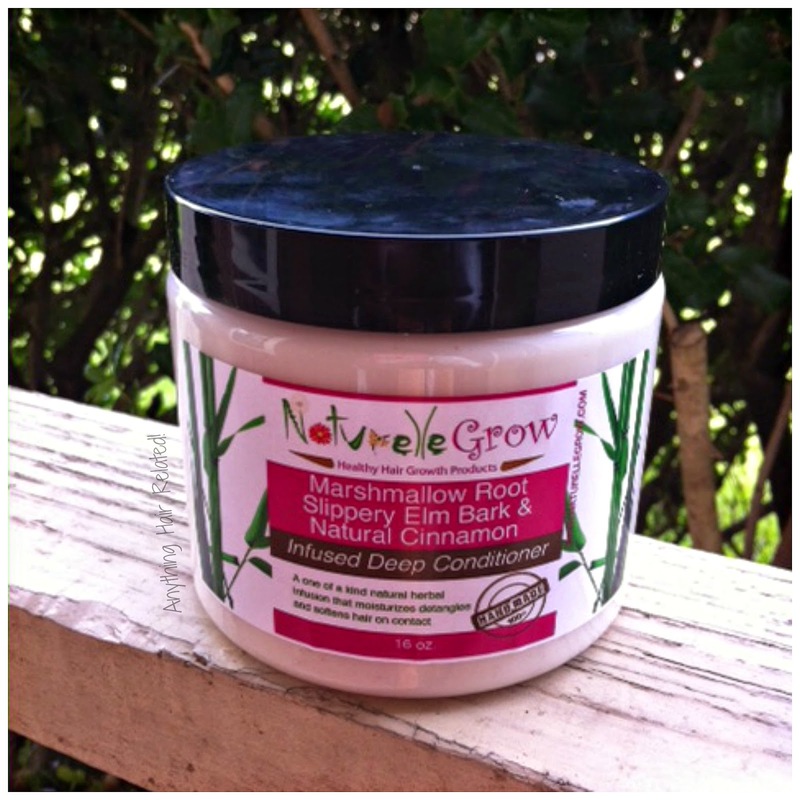 I've heard great things about marshmallow root and slippery elm but now I'm a believer. 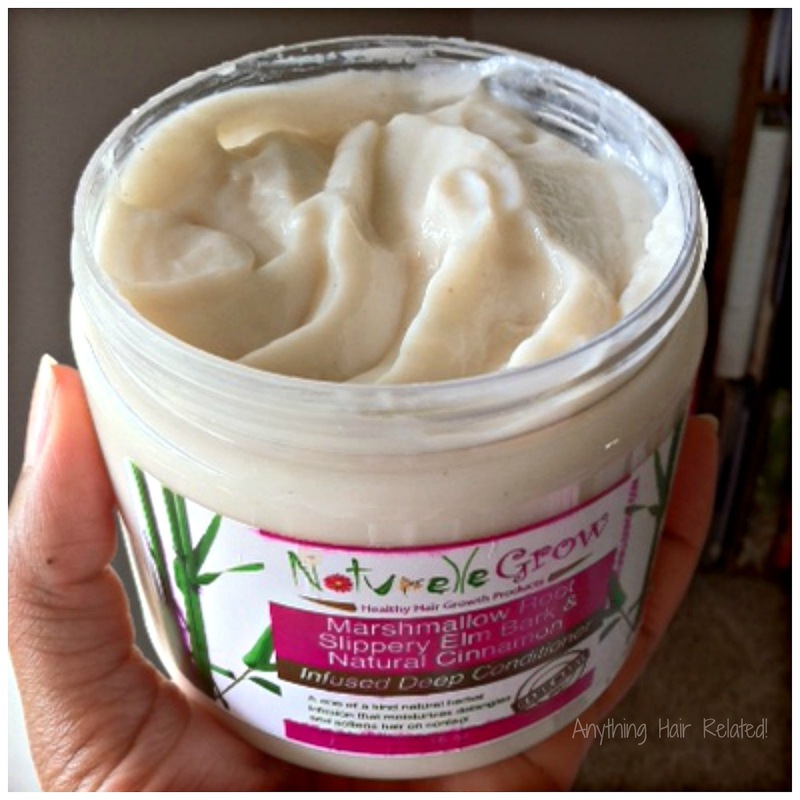 4 comments on "Product Review: Naturelle Grow Marshmallow Root Slippery Elm Bark & Natural Cinnamon Infused Deep Conditioner"
I have not been disappointed with any of the conditioners I have used from this line. If they are anything like this one, I know they're amazing. oh weee! I cannot wait to get my hands on it. I decided on the Mango coconut water one. Partly bc my hair is addicted to all things coconut and it also has Marshmallow root in it.........both has reave reviews so am keeping my fingers crossed. Lol go for it and please let me know how the Mango Coconut Water conditioner is. Sounds amazing already.